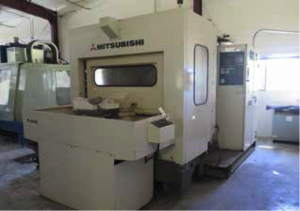 1994 Mitsubishi M-H4A 2-Pallet 4-Axis CNC Horizontal Machining Center s/n H4A015 w/ Mitsubishi Controls, 30-Station ATC, CAT-40 Taper Spindle, 10,000 RPM, 4 th Axis Thru Pallets, 15 ¾” x 15 ¾” Pallets,Chip auger, Coolant. Cincinnati Milacron “Arrow 1000” 4-Axis CNC Vertical Machining Center s/n 7049-AOB- 98-0478 w/ Cincinnati Acramatic 2100 Controls, Cincinnati Hand-Held Controller, 21-Station ATC, CAT-40 Taper Spindle, 8000 RPM, 20” x 44” Table, Coolant. Cincinnati Milacron “Arrow 500” CNC Vertical Machining Center s/n 7042-AOA- 96-1245 w/ Cincinnati Acramatic 2100 Controls, Cincinnati Hand- Held Controller, (ATC NEEDS REBUILDING), CAT-40 Taper Spindle, 8000 RPM, 20 ½” x 27 ½” Table, Coolant. 1998 Viper VMC-1500AG CNC Vertical Machining Center s/n 001464 w/ Mitsubishi KWS-960 Controls, 30-Station ATC, CAT-50 Taper Spindle, 3000 RPM, 29 ½” x 67” Table, Coolant. Kafo RE-1M VL CNC Vertical Machining Center s/n VL2103050 w/ Fanuc Series 15-M Controls, 36-Station ATC, CAT-45 Taper Spindle, 3500 RPM, 23 ½” x 82 ½” Table, Coolant. Bridgeport Series 1 – 2Hp Vertical Mill s/n 222663 w/ Bridgeport DRO, 60-4200 Dial Change RPM, Power Feed, 9” x 42” Table. LeBlond Regal 18” x 56” Geared Head Lathe w/ 30-634 RPM, Inch Threading, Tailstock, Aloris Tool Post, 10” 3-Jaw Chuck. 2006 Kaeser SK15T 15Hp Rotary Air Compressor s/n 1403 w/ Built-In Refrigerated Dryer, 80 Gallon Tank, 64 CFM @ 125 PSIG. Kysor / Johnson mdl. J 10” Horizontal Band Saw s/n H25688 w/ Manual Clamping, Coolant, Conveyor. Grob NS-24 24” Vertical Band Saw s/n 1848 w/ Blade Welder.